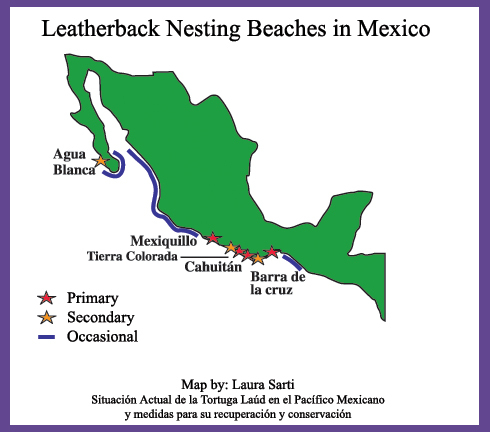 Agua Blanca has been identified as an important nesting site of the Pacific Leatherback by Mexican National Sea Turtle Coordinator, Laura Sarti. Plus, according to the IUCN (Internacional Union for Conservation of Nature), the recovery of the depleted Pacific Leatherback population requires "enhancing hatching success," and "full protection of all nesting beaches." Through nightly patrols and management of a special Incubation Greenhouse we are doing just that! We patrol this important nesting site every night throughout the Leatherback nesting season (October - April). 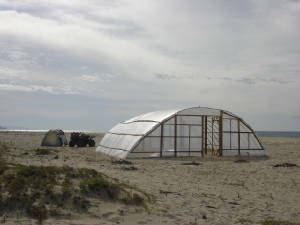 All Leatherback nests are moved into the specially designed Incubation Greenhouse where hatching success is greatly improved by elevating the sand temperatures. Without the greenhouse, Leatherback nests in this region fail to incubate, or produce very few, weak hatchlings. Our volunteers run nightly patrols to relocate nests, monitor the nursery, care for hatchlings, manage Hatchling Release events, organize beach clean-ups, and provide unique environmental experiences and recreation camps for local school-aged children.